URGENT. Stop whatever you're doing, grab some leftover holiday cookies and watch Larsen Thompson and Taylor Hatala's latest amazing video. These two powerhouses, who we all know and love as the Fraternal Twins, teamed up with SweetyHigh for their latest production, which is directed by Veronica Zelle and creative directed by Janelle Ginestra and Will "WilldaBeast" Adams. We saw a sneak peek of the vid in the first episode of Ginestra and Adams' "Making the Beast," and oh my goodness it does not disappoint. This video is the first of what we hope will be many from SweetyHigh's "Dance Haul" series, which focuses on #GirlPower, and features some of today's most inspiring young dancers. Check it out below! By now, it's pretty much a given that anything involving #immaBEAST—the company founded by Will "WilldaBeast" Adams—is going to be mind-meltingly amazing. 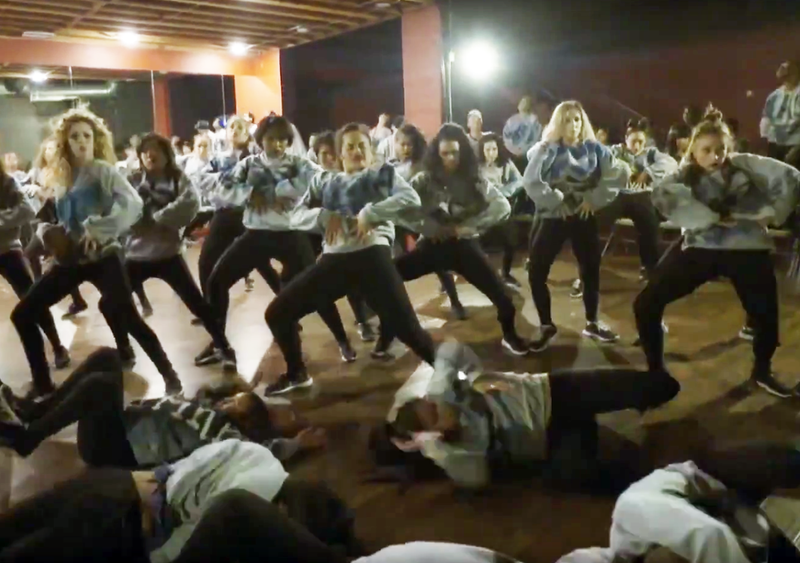 Case in point: Have you met the latest crop of #immaBEAST dancers yet? No? Well, let them introduce themselves to you in true beast fashion—i.e., via an EPIC DANCE MEDLEY. Choreographed by Adams and the equally formidable Janelle Ginestra (adorable couple alert! ), the just-released "Trap Queen Medley" features, yes, Fetty Wap, along with some truly great throwback hits (oh hey, Joe Budden). It's a four-and-a-half-minute marathon display of the incredible skills of the #immaBEAST dancers, including the #lilBEASTS and #babyBEASTS (adorable kids alert!). Basically, it's the video equivalent of one of those #MotivationMonday inspirational quotes. So many hashtags. So many #goals. OK, I know it's a little bit early for this, but I'm gonna go ahead and tell you guys my New Year's resolution: In 2015, I resolve to be half...no, a third as cool as the girls of Will "WilldaBeast" Adams' LilBeasts. You know we've been all about the LilBeasts for a while now. So many of the hip-hop minis catching our eyes these days turn out to be WilldaBeast disciples. (Exhibit A: Taylor Hatala.) He sure has a gift for finding and cultivating swag in its earliest of stages. So why the sudden, new-found need to declare my love and admiration for the lady LilBeasts, in particular? A couple weeks ago, WilldaBeast posted a new video to Ciara's "That's Right," featuring Sydney Rosefsky, Jordyn Jones, Tati McQuay, Kyndall Harris, Kaycee Rice and Lexee Smith. Um...it's amazing. Got to go start practicing. 2015 is just around the corner! If you're in the L.A. area tomorrow, don't miss your chance to see WilldaBeast make his TEDx debut. Wait, say what? According to an Instagram from the other day, our favorite choreographer/dancer/entrepreneur/all-around dance revolutionary WilldaBeast has been invited to speak at TEDx Watts, an independently organized all-day conference showcasing "ideas worth spreading." Willdabeast, who's serving as choreographer of the project, posted these behind-the-scenes videos on his Instagram page and they're filled with tons of dance-y goodness, plus a discussion with the creative team (which includes Janelle Ginestra 🎉). The clips also feature lots of our fave dancers like Jade Chynoweth, Simrin Player, Dominique Battiste, Noah Tratree, Jake Landgrebe and Jalen Preston.